Wastewater utilities have a new opportunity to turn their sludge (biosolids) into something special. An interesting paradox exists in municipal wastewater treatment: When it comes to innovation, there is both great need and great resistance. Largely it’s because the stakes are seen as too high to veer from the tried and true. However, some so-called “new” technologies are more market-ready than others. One particular technology, a biosolids management system that has been proven for years in Canada, seems especially ready to make swift and substantial impact in the U.S. — for both utilities and the agricultural community. Utilities can benefit from the technology in a number of ways, including the reduction of sludge volumes and associated costs, improved biological nutrient removal (BNR), and increased biogas production. Farmers benefit by getting a “Class A,” high-organic-matter fertilizer that’s easy to apply and better for the land. Lystek International, founded in 2000, is finally bringing the technology to the U.S., and what better place to start than in New York City? 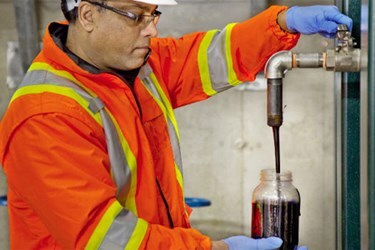 Lystek, in cooperation with Manhattan College, is currently undertaking a confirmatory study for potential application at plants, such as the Hunts Point Wastewater Treatment Plant (WWTP), to ensure the system's efficacy for the Big Apple’s treatment requirements. The company is also negotiating with municipal clients in California — a massive agricultural market — setting the stage for bicoastal adoption in two prime locations. According to Lystek's president, Rick Mosher, the system allows WWTPs to reduce sludge volumes by up to 30 percent, increase biogas production by up to 40 percent, and produce (for potential sale) a pathogen-free, nutrient-rich fertilizer for farmers. Marketed as LysteGro, the fertilizer is unique due to its liquid form, allowing it to be subsurface-injected for even distribution and a 10-fold reduction in odor as compared to historical, Class B application. “It’s not as good as commercial fertilizer — it’s substantially better,” Mosher contended. 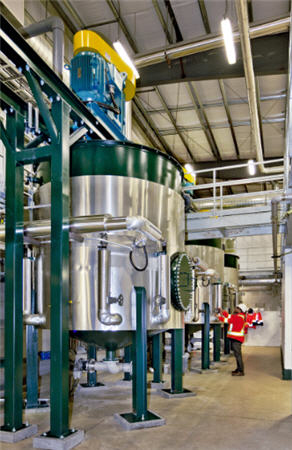 From a plant equipment and operations perspective, the system is basically “a severe pasteurization process” that incorporates heat (at 70 degrees C/158 degrees F), alkali (typically potassium hydroxide), and high-shear mixing to achieve hydrolysis, or breakdown, of the organics present in biosolids. The resulting low-viscosity liquid is not only available as a U.S. EPA “Class A, Exceptional Quality (EQ)” and CFIA-registered fertilizer for land application, but can also be leveraged for plant optimization. By adding pumps and piping, WWTPs can recirculate the material to enhance microbial activity and performance in BNR tanks for denitrification and within anaerobic digesters for increased biogas production. “It’s like enriched baby food [for microorganisms],” said Kevin Litwiller, Lystek’s director of business development. The system itself works at the back end of the treatment plant, so regular treatment operations are not affected during construction or implementation. O&M requirements are very few once installed — temperature and pH control, along with change-out of the mixing blades every six months or so. The typical setup requires a modest footprint (“from as little as 1,000 to around 2,500 square feet,” according to Mosher), and the reactors are also completely modular — they can be sized for a treatment plant serving 15,000 people or for a city the size of, say, New York. Back home in Dundalk, Ontario, Lystek has constructed a plant that treats biosolids and organics from a variety of customers throughout an 80-mile radius. Nestled among farmlands, the Organic Material Recovery Center converts up to 150,000 tons/year, and serves as a model for what Lystek envisions in California. In addition to helping WWTPs, Lystek’s solutions can benefit industries such as food, beverage, agriculture (of course), and virtually any operation that produces organic waste. Whether it’s Lystek or some other technology, utilizing wastewater for its inherent value is tremendously important. Phosphorus — the “P” in N-P-K (nitrogen-phosphorus-potassium) fertilizer, which is essential for growing crops — is typically mined from phosphate rock, mostly outside North America. A report from the Soil Association predicts that the resource will “peak” and become increasingly scarce after 2033. The report also notes that when demand for phosphate fertilizer outstripped supply in 2007/08, the price of rock phosphate jumped 800 percent. These factors point to both the need for a new source of phosphorus (i.e, wastewater) as well as the enticing market potential for fertilizer producers.